The Buffalo Challenger doesn’t have much of a web presence, so a lot of what gets published there flies under the radar, but a reader directs my attention to an “open letter” that Buffalo HR Commissioner Karla Thomas published in the Challenger this past week. The theme of the letter is that Byron Brown isn’t the leader he could be thanks to a “cancer” in his cabinet: Mayoral underboss Steve Casey. This letter is not intended for Mayor Brown. It is addressed to the man whose leadership I have followed for over two decades. Its’ intent is not to be mistaken as malicious, but to be accepted with the love it is being sent. On behalf of myself and our community, I am appealing to the sensibilities of the man who this community entrusted their safety and caretaking through the electoral process. Byron, there is a cancer in your cabinet. Its name is Steve Casey. His presence in your camp has derailed the direction of your purpose. It has inflicted pain and confusion on innocent people and employees and brought organized chaos to your leadership. His quest to become powerful through your anointing must be stopped. If there was ever one thing our peers always believed about you, Byron, is that you were fair. In evaluating the up and down side of a situation, you always opted for what was right. That was your leadership style, pre-Casey. Your decision however, to fire me without due process and refusal to pay out the remainder of my term is reflective of Deputy Mayor Casey’s influence on your decision making. This decision serves no real purpose nor is it politically prudent. It is, however, definitely politically motivated. The timing of my termination (right before Golembek’s primary) speaks volumes about the real purpose behind your actions. You simply gave in to some heavy political pressure from people who had nothing to do with getting you re-elected. I am respectfully requesting you return to the leadership style hat got you elected Masten District Councilman, NYS Senator and Mayor of the City of Buffalo. This Social Security Death Master has been given God status. The $800,000 spent on health care premiums for dead retirees is not lost. It was stolen by those families who knowingly used insurance they were not entitled to. Our Comptroller should be trying to get that money back from those families–not trying to help fire me. Relations with our labor unions are greatly improved. The new Director of Compensation and Benefits is making phenomenal strides in finding and correcting decades old systemic problems with service delivery and overall division functioning. The Civil Service Division is operating efficiently and the Personnel Division is gearing up to conduct collective bargaining agreement training. All of these things have occurred under my watch. I have no more business being fired than Casey does remaining your Deputy Mayor. Our detractors are ecstatic watching us prepare to commit suicide on the spirit ofour beloved Grassroots legacy and do irreparable damage to any opportunity or dreams you may have for higher office. I besiege you – look for an exit route for Steve Casey. As long as he breathes in your cabinet, it will be on life support, leaving our city gasping for air as he continues to negatively impact your leadership with clandestine poison. The final destination of this journey we have embarked on is a place called disaster. Neither one of us will arrive safely if you opt to take this trip to the end of the road. While the outcome for me may impact my employability, it will leave an indelible mark on your political career. Byron, the best chemotherapy you can give your advisory cabinet is to change its composition. Give it a make over. Replenish it with diversity and some good old fashioned Buffalo born and bred loyal statisticians. Then and only then will this community’s confidence be restored in your leadership of the City that loves you, embraced you and that God has strategically placed you at the head of. Steve Casey . . . the eminence grise of City Hall. Or Willie Tyler to Byron Brown’s Lester. The amount of electronic ink that’s been spilled on Steve Casey is practically unending. I won’t recap every last City Hall scandal here; a simple search for the man’s name here on WNYMedia would produce an avalanche of reading material. Go ahead — I dare you. Instead, I’ll just remind the gentle reader of some of the more classics of the man’s pettiness and corruption, the sort of gems that have been lost amidst the sea of sewage emanating from the second floor of City Hall. Remember when Casey ran Brown’s 2005 campaign for mayor while still on the State Senate payroll? Or when Casey decided he didn’t have to pay to park outside Brown campaign headquarters because he was on “state business” — you know, the business of getting Byron Brown elected mayor? Or (my personal favorite) when he sicced city inspectors on a neighbor because she had the temerity to display a lawn sign in support of Mike Locurto? Fantastic! Councilmember Bonnie Russell (5 seed), on the other hand, is the summation of everything bad about the average Buffalo politician. She can’t pay her bills, and has multiple liens filed against her (one for $573 – really?). She is married to a judge, exemplifying our inbred political system. And she can’t show up for meetings, much less represent her district (University Heights), much to the constant chagrin of the Answer Lady. If you are looking for an upset for your bracket, I think you’ve found it here. Glenn Gramigna has two stories detailing the apparently illegal harassment that Ali suffered at the hands of law enforcement because he allegedly sent out some emails accusing Byron Brown of teh gay and Joe Illuzzi of soliciting blow from Steve Casey. All of those emails were so over-the-top that they were patently false to any objective observer. I’m sure the Mayor was pissed beyond belief, but it doesn’t mean you break the law. Two wrongs, etc. Byron Brown for US Senate? 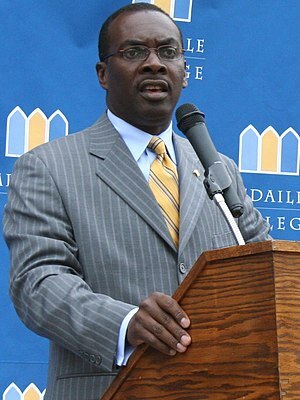 Anyone with a memory of Mayor Brown’s illustrious career in the State Senate will remember that, of four ground-breaking bills he introduced, three involved changing the names of certain streets in the 60th SD. That’s street-name change we can believe in. Seriously good government, earth-shattering stuff. Mr. Pigeon is also a co-chairman of Responsible New York, a political organization backed by the Rochester billionaire Tom Golisano. Any buzz, therefore, about Brown going to the US Senate, is in Pigeon’s head. Think about the Brown administration’s ham-handedness and insular secrecy. Think of the utter charade that is a CitiStat meeting. Think of the hirings and subsequent, often rapid, departures of people to help run the Brown administration. Think of Casey’s cameras, and the way in which their camp has tried (and usually failed) to take over the county Democratic committee, and allegedly used scare tactics and intimidation in order to do it. Think about how City Hall requires a FOIL request for the most routine public record. If you think party machines are bad, evil would-be party machines are worse. The only viable, responsible choice from upstate to replace Senator Clinton would be Brian Higgins. Although the thought of sending Steve Casey 500 miles from Buffalo is an attractive idea. No, not the rumors about Mayor Brown supposedly being investigated by the FBI or considered for an Albany post with Governor Paterson. The unceremonious firing of Commissioner of Economic Development, Permits and Inspection Services, and all-around smart guy Richard Tobe. Tobe didn’t get along with Byron’s Thing One, Steve Casey. End of discussion. I remember attending a Spitzer speech on saving cities, before the election. I was trying to get a feel for his ideas and rhetoric, what sort of inspiring inaugural speech he might give us, what grasp of imagery he had, what fresh ideas for Syracuse he might have. It felt like a very wonky speech, without much new in it. I thought this was just a style we would have to get used to, and wait and watch harder for the breaks of light in the rhetorical clouds. But those breaks of light never really came. And of course, the little disappointments unfolded against a constant state of war. Hope after hope, continued waiting and hoping, and little disappointments here and there. And questions floating in, vague wonderings if Spitzer really “got it.” Of course he did. How could he not? All one needed to do was wait just a little while longer. We had an understanding, Eliot and I. And now we trade a headstrong, combative downstate executive for a more conciliatory, likeable downstate executive. There is very little that an Albany pol can learn about upstate’s problems by doing a weekly run up and down the Taconic. Spitzer leaves mass quantities of unfinished business – both macro and micro. Paterson may be a nice guy, but I get the sense that he’ll be more of a caretaker, keeping the heat on while waiting for the next superhero to be elected savior in 2010. Oh, and don’t for a second believe all of Mayor Brown’s talk about how close he is with David Paterson, and how this bodes well for Brown’s clout in Albany, and for Buffalo. Steve Casey didn’t get his job with then-minority leader Paterson by dint of his resume alone, and there was a lot more going on during Brown’s senate tenure than just the re-naming of street signs. Brown was the vote that swung the minority post Paterson’s way, and it didn’t come without some major dealmaking. Dealmaking that Paterson may not remember as fondly as does Brown.